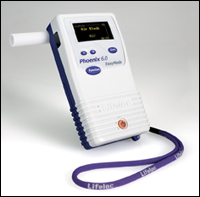 The Phoenix 6.0 is the leader of Lifeloc's family of evidential testers. 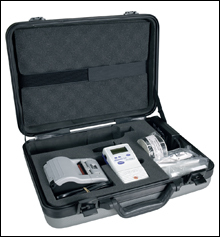 It is the most sophisticated, yet easy to use evidential instrument on the market. Can be purchased in a kit (pictured above) with all the supplies you need to get started including the PermAffix printer! Call or email for details and a quote. EasyMode™ "walks" operator through DOT test protocol. 250 test memory with calibration and cal check results. Lithium battery back-up. Greatly simplifies dry gas calibration using built-in barometric pressure sensor. All tests and calibration information accessible through the display. Choice of 1, 2 or 3 copies, short or long format. PermAffix™ Labeling System utilizing a patented evidential, tamper-evident label. Wireless printing with Bluetooth enable printer. Four AA alkaline batteries. 80 hours of on time, up to 4,000 tests per set. Internal lithium battery for real-time clock and memory back-up. Automatic, Manual and Passive test modes. Batch I.D. / Subject I.D. Capable of storing a Batch I.D. such as operator or location and a Subject I.D. that is unique to each test. Adjustable between 1-30 minutes or may be disabled. Dry gas or wet bath. Automatic calibration, software controlled adjustments, no tools necessary. Warns of expiration and locks unit upon calibration or cal check expiration. Advanced one-inch electrochemical fuel cell, alcohol specific. Automatically actuated electronic pump. No cocking required. 1.65 x .87 inch (42 x 22 mm) viewing area graphic OLED. Adjustable contrast. Graphs breath flow and alcohol level. BAC standard. Available in other common units of measure. Immediate on negatives, under 10 seconds on positives. Immediate on negatives, under 30 seconds on positives. DOT approved at +/- .005 BAC to .100 BAC, +/-5% between .100 to .400 BAC. Programmed self-check assures unit is operational upon power-up. Optional software for downloading/printing tests to a PC. 2.6 x 5 x 1.25 inches (66 x 127 x 33 mm). One year Deluxe Limited Warranty; parts and labor. One-piece, individually wrapped, disposable. Quick snap-on design directs exhausted breath away from operator.